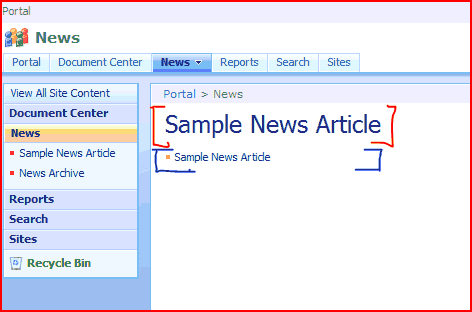 Well, I’ve been asked to examine some of the options for doing content roll-up in SharePoint. I thought I’d present this as a bit of a mini-series, rather than one huge post. I’ve bracketed both the web parts being used with red and blue – otherwise it’s not clear that there are two web parts doing content roll-up here – one for the most recent headline, and another to show a list of recent News items. There are lots of other examples of where this is useful – consolidation of tasks for a user is another common requirement, or rolling-up all the documents of one type or another – such as expenses, etc.. Anyway, over the next week or so I’ll examine some of the solutions to content roll-up that I’ve seen. It’s not meant to be an exhaustive list – there are quite a lot of solutions to content roll-up around, and you can write your own – but why reinvent the wheel? I need a rollup task list. I was looking for some 3rd party webparts but none of them search across multiple site collections. The problem is I have one site collection for team sites, one for project sites and one for mysites. I want the webpart to show up on the mysite and it list all tasks assigned to the logged in user that spam across all 3 site collections. Is this possible?? Sorry about the delay, I was on holiday! Yes, either the Bamboo or Lightning Conductor solutions will do that.